An invisible gel, handy for skin blemishes. 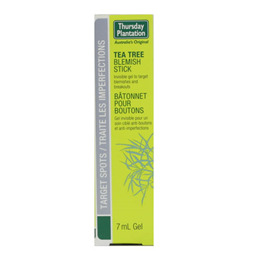 Tea Tree Blemish Stick is a special blend of Tea Tree Oil, Vitamin E and Spearmint Oil to help remove skin blemishes. Contains 100% pure Australian Tea Tree Oil, a natural antibacterial ingredient to remove build-up of bacteria on the skin.Convenient sponge tip applicator. No need to touch the skin with fingers. Aqua / Water, Alcohol, Polysorbate 60, Melaleuca Alternifolia (Tea Tree) Leaf Oil, Carbomer, Potassium Hydroxide, Mentha Viridis (Spearmint) Leaf Oil, Tocopheryl Acetate. Apply on blemishes as frequently as required. It is recommended you skin patch test prior to use. For external use only. Below are reviews of Thursday Plantation Tea Tree Blemish Stick - 7ml by bodykind customers. If you have tried this product we'd love to hear what you think so please leave a review.